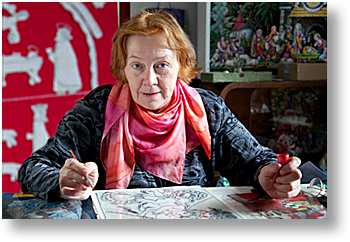 In her beloved museum, Svatava doing what she loves best — besides cutting-out and assembling nativities, that is — reverse-glass, podmalby painting. There was a message waiting for me when I returned home from Istanbul, the last stop on my European trip. The address, ZÁBRDSKÉ BETLÉMY, Zábrdí 1, 38421 p. Husinec, Czech Republic, brought back fond memories of my recent visit to the wonderful world of Svatava Vizinová. "For your Christmas tree," she writes, and thoughtfully adds, "not only for your Christmas tree… For everybody who would like it, of course "
After the smiley face, she writes, "1907, maybe older… the date is on reverse, on hand[-written] dedication…"
What better way to recover from living out of a suitcase for almost three-months — not to mention from a touch of jet lag — than spending a few hours with a beautiful paper nativity? It turns out that a good friend of Svatava's had already done a lovely job fixing the ravages the paper nativity had suffered over the decades. 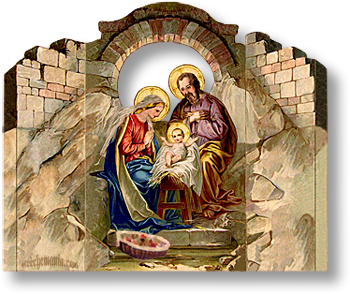 Still, what was to be done with the low-resolution sections like the heads of Mary and Joseph? There were other problematic color and pixilated sections to be dealt with in sections of the upper front, not to mention the missing side walls of the back section. 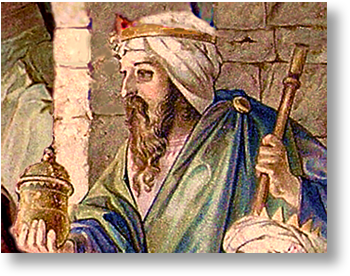 This detail of a crowned, bearded Magi shows the soft colors and rendering of Svatava's Nativity. Speaking of the back section, you'll notice in the before-and-after images below, that I amplified the width of its center panel. This was done so that the back side walls — and their tabs — would better clear the front archway. Also, plants, stones, rocks, and the angelic banner — to mention just a few — needed some attention. It's been a long time since I've picked up an X-acto knife, and loved assembling Svatava's Nativity. And you will, too. It's so simple, even a child could do it. But, for safety's sake, keep X-acto knives out of children's reach. Small scissors are are more well-suited to smaller hands. There are many printing options. Always a consideration for me is the size of the finished nativity, in this case, 5.5 x 4.75 x 1 inch. With her compliments and good wishes, Svatava's Nativity is available as a free Crèchemania.com Download. 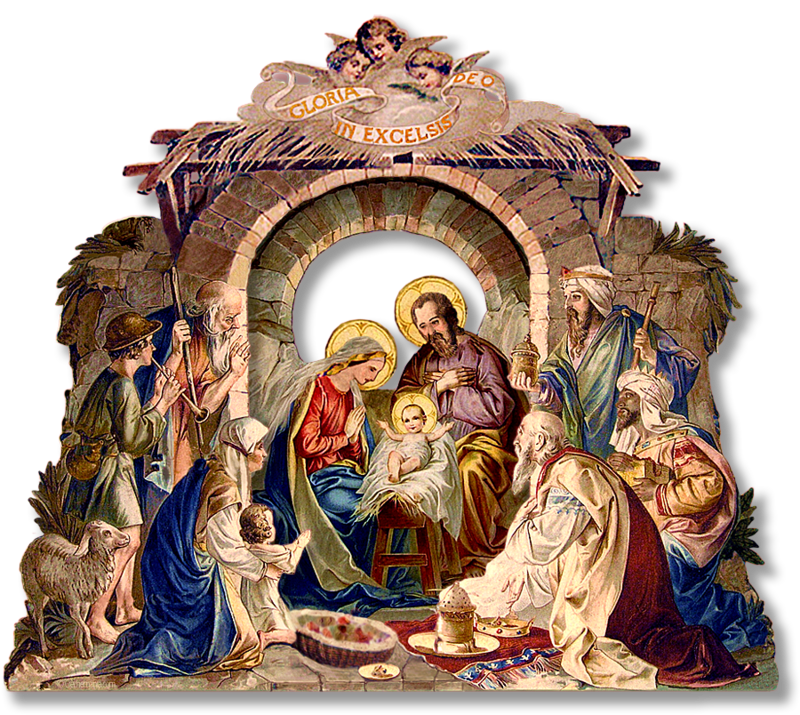 Two reasons: the graphic state of the scans were one consideration — they almost disappear at a smaller scale — but, more importantly, is the fact that I wanted to add this lovely nativity to the Crèchemania.com Crèche Tree Collection. Have you seen my Crèche Tree? Friends are always delighted to find an almost twelve-foot tree laden with nativities, and I'm always on the look-out for beautiful additions, and Svatava's Nativity seemed an ideal candidate. 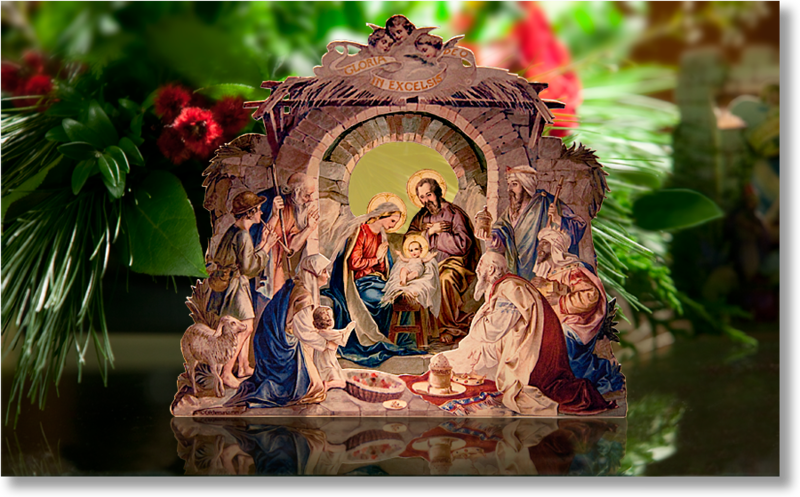 In printing my nativity I used Epson Premium Presentation paper. Its extra thickness is perfect for paper construction, and its matte surface takes the color beautifully. You might choose Epson's glossy Premium Photo Paper, instead, for that extra pop in color and saturation it offers. And its tendency to curl would not prove a problem in this small, 5.5 x 4.75 x 1 inch, nativity. 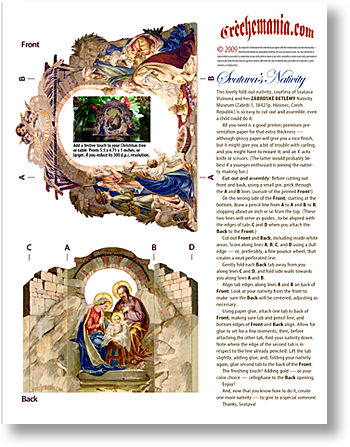 However, if you use the 300 d.p.i.-resolution images in the downloadable PDF to print a larger nativity — by choosing 150 d.p.i., which would still render a great-looking printout — you might consider mounting your glossy print on card stock before assembly. At least you should consider this for the front, since, the back will be naturally reinforced and strengthened due to the folding. Let's see: is there anything more to say about this fun project? Oh, yes, I decided to add gold cellophane to cover the arch on the back of the nativity. It adds a nice glow. And I made the center back panel wider, so that the side walls will attach to the front a small distance from the very edge of the arch. Roll your mouse on and off the Crèchemania version, above, to see the differences with the original. Note the new heads, finished walls, wider center panel, and added tabs. Svatava tells me as soon as the original nativity is back in her hands — a collector friend has it in Prague just now — she will scan it again and send it to me. So, who knows? We might yet see even a better version of this nice nativity. As soon as my Crèche Tree goes up, I'll have my camera ready to take a photo of Svatava's Nativity. For now, enjoy it, below, adding a festive, holiday touch to a flower arrangement. 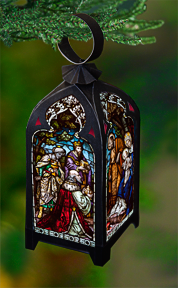 Svatava's nativity is a perfect Christmas decoration for the table or the tree. Notice the nice touch provided by the cellophane added to the back window.